There are many different types of wood that may be used to create wooden countertops for the home. Each of these different types of wood has different properties and appearances that might make them more or less attractive to the homeowner. It is important to know which types of wooden countertops are available for purchase to make an informed decision about which type of countertop is best for your home. Oak Wooden Countertops – wooden countertops made out of oak are some of the most popular types of wooden countertops available on the market today. Oak countertops will generally be available in two different shades, dark oak and light oak. Light oak, often called golden oak, is a yellowish-tan bright color with tan grain lines running through it. Dark oak is a deeper tan color with brown grain lines providing a nice contrast to the color of the wood. Pine Wooden Countertops – pine is one of the lightest colored wooden materials used for the construction of furniture items and countertops. The color of pine countertops can range from a pale tan to an almost off-white color and are generally used with light colored or white cabinets in the kitchen area. Because of the light color of the wood, the countertop must be cleaned on a regular basis because any dark material on the wood will be highly visible. Cherry Wooden Countertops – cherry wood is another popular countertop material because there are so many other furniture items that can be purchased in cherry to match the countertop. Dark cherry countertops have a deep maroon sheen to them while light cherry countertops look like they are closer to orange than tan. The color of a cherry countertop is considered to be unique among woods as no other type of wood comes close to the color of cherry wood. Mahogany Wooden Countertops – using mahogany wood for a countertop material is not seen very often because of the high price of mahogany wood, but some people choose to buy countertops that are stained the same color as mahogany wood. Mahogany wooden countertops are a deep brown color with a reddish hue that gleams in the light. Walnut Wooden Countertops – walnut wood is one of the few woods used for countertops that are actually brown in appearance, the color that most people think of when they think of wooden countertops. The neutral nature of this type of wood makes it a welcome addition to virtually any kitchen because the color of the countertop complements any type of color used in the kitchen area. This type of countertop is generally purchased when the homeowner does not want the countertop to be the focal point of the kitchen or when the cabinets are the same color. 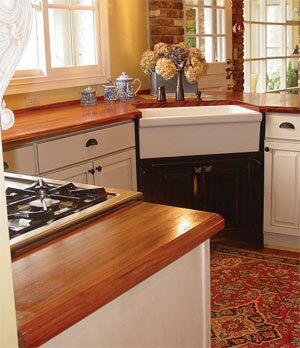 Stained Wooden Countertops – wooden countertops can be stained in just about any color that the homeowner desires. Some people want their countertops to be stained the same color as a more expensive type of wood while other prefer for their wooden countertops to be stained in colors that nature never intended wood to be. The most common colors for wooden countertops to be stained are black, blue, green, red, and yellow.